We released a story this morning about one of our first NetSuite e-commerce search customers, InkJetSuperstore.com. Click here to read the press release. 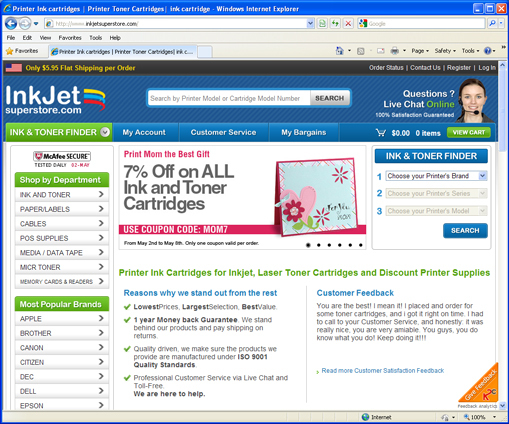 InkJetSuperstore.com is a long time NetSuite customer and an early adopter of the NetSuite Ecommerce platform. When you walk along the hallowed halls of NetSuite and whisper “InkJetSuperstore”, it is like the old E.F. Hutton commercials – everyone stops and listens! InkJetSuperstore is that important to NetSuite! E-commerce is InkJetSupertore’s ENTIRE business. Thus, e-commerce is their mission critical, “bet your business” software. Search is an essential part of this. Nearly one-third of all InkJetSuperstore.com visitors immediately go to the search box, making search a critical tool for customer conversion. Adding to the complexity is the cryptic set of printer and cartridge model numbers visitors will search for, and the complex relationships between printer models and various after-market cartridges. Two of our competitors tried to implement their e-commerce search solutions for InkJetSuperstore prior to EasyAsk. BOTH FAILED. We not only implemented EasyAsk on the first try, but did so quickly and efficiently. InkJetSuperstore is also a testimate to superior engineering. Among other things, EasyAsk has developed a unique integration with NetSuite Ecommerce that maintains superior Search Engine Optimization than other 3rd party solutions. In addition, we done some automated integration with the NetSuite item catalog via web services, and taken EasyAsk unique features like our SKU processing and mapped these directly to NetSuite (in this case Matrix items). As we talk with more NetSuite customers, we are discovering the SEO issues is a REALLY BIG DEAL. A number of NetSuite customers have seen their SEO drop off dramatically when using 3rd party search solutions. And now, they are talking to us! And the timing is great with NetSuite SuiteWorld coming up next week in San Francisco. NetSuite Ecommerce customers, stop by and we will show you how we solve the 3rd party search SEO issue. Congradulations to InkJetSuperstore and thanks for being a great customer. Expect to see many more customer announcements in the near future. Watson, come here, I need you. (to be clear, Mr. is at the beginning of this quote) Famous phrase uttered by Alexander Graham Bell, the voice-over-wire transmission. Elementary, my dear Watson. A famous Sherlock Holmes line, never written by Arthur Conan Doyle, by the way. Straight out of the movies. So, Watson has always been widely recognized. But now Watson is EVERYWHERE , and with good reason. We congratulate IBM for their impressive (and expensive) accomplishments in building a Natural Language solution designed to win at Jeopardy. We understand the enormity of the challenge. After all, we’ve been building Natural Language solutions for Ecommerce and Business Solutions for a decade.
. . . we won’t put your business in jeopardy. But instead of ‘shoes and ships and sealing wax’, let’s talk about something that is new, different and exciting: the emergence of Natural Language as the next logical step in the evolution of search and business intelligence. When you think of search, you probably think first of Google, and with good reason. They’ve done a masterful job of establishing themselves as the pre-eminent force in the field of ‘search’. Google taught us all how to search. But, the problem is, they taught us all how to search . . . WRONG. With Google you don’t search for exactly what you want. You search for ‘kind of what you want’ and hope that what you’re really looking for will be on the first few pages of the 10,000 they return. ‘The time has come . . . ‘ to talk about NLP – Natural Language Processing and how computers can now understand, not only the content, but also the INTENT of what it is that you are looking for. Our mission, at EasyAsk, has been to expand beyond the traditional ‘key word’ search bottleneck and provide the next generation of NLP-based search for both ecommerce search and merchandising, and business intelligence solutions. We’re proud to claim a leadership role in helping advance both the adoption and functionality of Natural Language search. EasyAsk powers the ecommerce search within the GAP, Lands End and others on the high end, Shuler Shoes, Travers Tools and others in the SMB space. Our partnership with NetSuite provides EasyAsk solutions to their SMB/SaaS markets. We now, proudly welcome both IBM and Microsoft to our side of the table. As I’m sure you know Microsoft’s search engine, Bing, is also an NLP-based solution. I, like many of you, use Google, but also use Bing. The results are different. In my experience Bing understands my ‘intent’ and provides a more accurate response to my question. It should. It’s a pretty good NLP engine that crawls the web. Now we are watching the launch of IBM’s Watson project. The Jeopardy challenge is an excellent test of what an NLP-based solution can do when the right resources are applied. We applaud IBM for this incredibly, successful project and for furthering the cause for NLP-based computing. But how does this impact you? You’re in business. Maybe you’re a small business looking for an accurate ecommerce solution. You have lots of choices. All of the search engines you’ll look at are pretty good. Almost all of them are ‘key word’ based, some provide navigation. Only one provides an NLP-based engine that will give your customers the item they are searching for on the very first page, every time. Only one allows you to search for products ‘less than $50’, for example. Only one leads the industry in converting browsers to buyers. EasyAsk. Now imagine similar NLP technology that powered IBM’s Watson, optimized for your corporate information. Watson was able to compete and win at Jeopardy because it understood the questions. You communicate to Watson exactly the way you’d speak to another person. With EasyAsk Business Edition, you ask questions of EasyAsk exactly the way you’d ask of your VP Sales or your CFO. For example: ‘show me customers who bought products last year, but not last quarter’. It’s easy, just ask. EasyAsk. So, we welcome both IBM and Microsoft to the next step in the evolution of search. It’s just a better way to search. But . . . and I just can’t resist this . . . we were here first! Next time, let’s discuss the perfect front end for CRM! Thanks for listening.